CII has envisaged a national movement for mainstreaming Corporate Social Responsibility (CSR) for sustained inclusiveness as part of its social development agenda. The Indian Industry has been working towards social development by engaging with the government, community and civil society. As part of the advocacy agenda, CII has been working with the Government to draft and strengthen the CSR legislation and develop National Voluntary Guidelines. 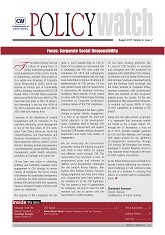 The CSR legislation has given a new impetus to CSR activities in India. The corporate sector has also been engaging with the Government in contributing to national programmes like the Swachh Bharat Abhiyan, Beti Bachao Beti Padhao, Skill India etc. CII, in partnership with the Bombay Stock Exchange and Indian Institute of Corporate Affairs, has created an online platform ‘Sammaan’, to bridge the gap between corporates and NGOs with legitimate records. The annual CSR Summit organized by CII brings together stakeholders to review and strengthen the CSR movement and make CSR an actionable business agenda. In 2011, CII set up the CII Foundation, a trust to engage companies towards designing, developing and managing impactful CSR projects. The CII-ITC Centre of Excellence for Sustainable Development has also been helping companies to develop CSR policies, build their capacities, measure impact and social return on investment. This edition of the Policy Watch highlights some important issues and recommendations on enabling effective CSR in India.